Topic: Talking about SkillPoints : what's your solo rank ? 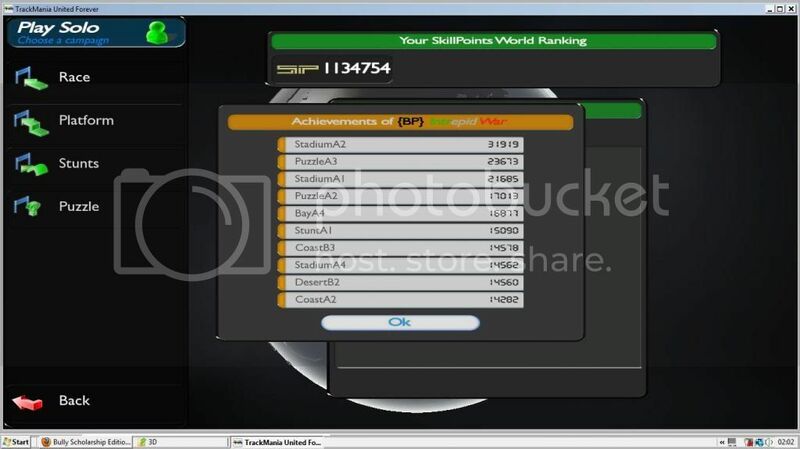 Re: Talking about SkillPoints : what's your solo rank ? Had the day off college and set some nice recs on Coast and Bay and even on Nations. Haven't played them tracks in a while. Forgot about this thread. been a while since I played solo mode as well. did tonight and got a few extra SP for my troubles. Think I'm up 60 thousand. I sent you a PM. Erm no I use a cheap little pc joypad. I have a question as well. In the pic at the top the tracks have weird names and why is the SP max 4700? Where did you get those tracks? Nah haven't been online much because it's Christmas. i may give it a try later today though and see if it's still an issue. As I said the other racers had higher ranks than me yet they were getting 75 lp and more. I remember one time I came 7th and got 40 lp. Which is crazy and 22 lp for 11th. It was a really weird session. Still trying this. Man me head is melted. I'm still getting this message every time "Account successfull registered, this account needs activation, you can't use it now!" Then I'm in no mans land and no matter what combo of log in and pass word nothing works. I've no idea how to activate the account. Hey Mo nice to see ya. Erm can ya fix my log in on Bears, it seems to be broken ^_^. Thx for the replies everybody. Apparently the guy has moved his times from the Irish zone so that's that, but I still think it's really odd that can even happen. Why anyone would want to is beyond me but how and ever.